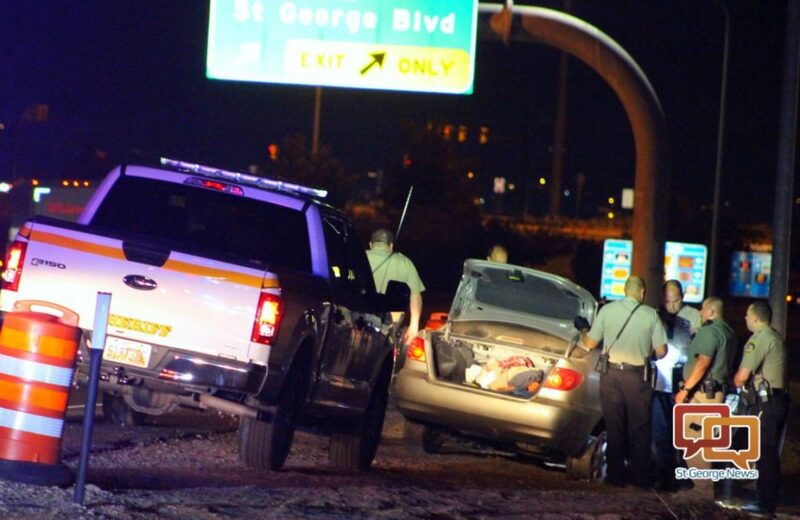 ST. GEORGE — A high speed car chase that crisscrossed both sides of Interstate 15 ended late Wednesday night after law enforcement officers set out two sets of spike strips to disable the fleeing vehicle. A Washington County Sheriff’s deputy pursuing the car was injured when the driver, later identified as Jock Waylon Thacker of Louisiana, crashed into the deputy’s truck as he tried to evade the officer, Washington County Sheriff’s Sgt. Nate Abbott said. 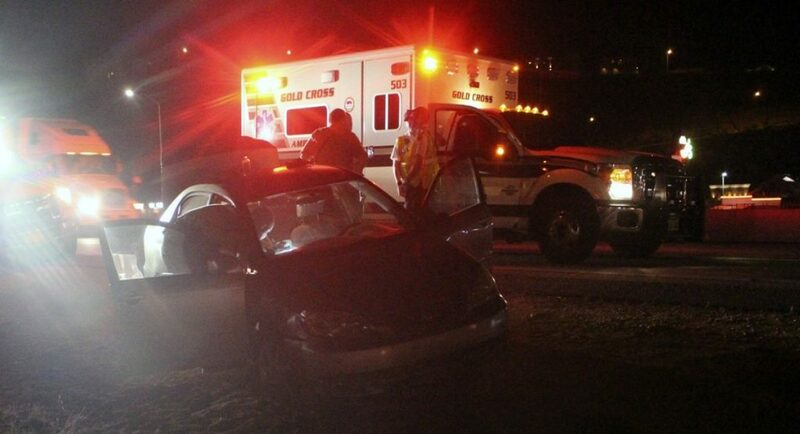 The pursuit began just after 9 p.m. when a Utah Highway Patrol trooper attempted to stop a Toyota Corolla on I-15 northbound near Exit 2 for a broken head light. Instead of pulling over, Thacker sped away and the trooper quickly followed close behind, Abbott said. 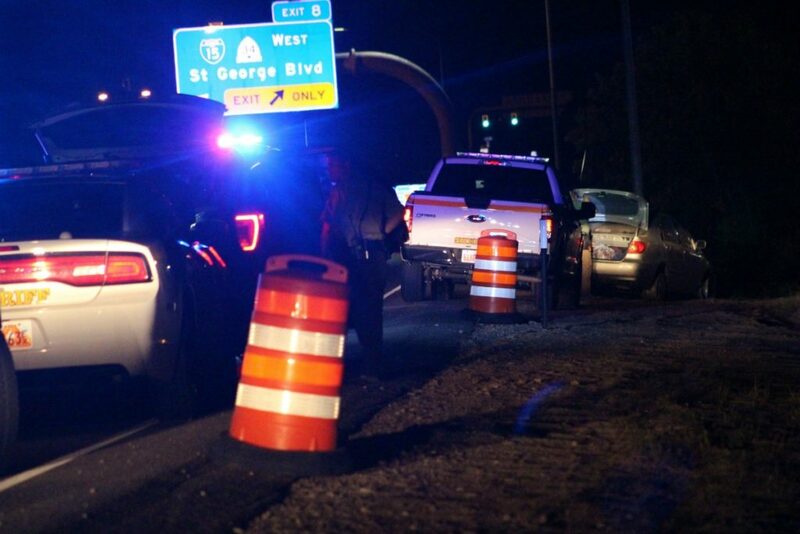 Soon after it began the trooper terminated the chase for safety reasons as it entered a construction zone on I-15. Thacker continued speeding north on the interstate and within minutes a Washington County Sheriff’s deputy also driving on I-15 observed the vehicle near Exit 16 and began pursuing the car, Abbott said. “They were going 105 miles an hour,” Abbott said. 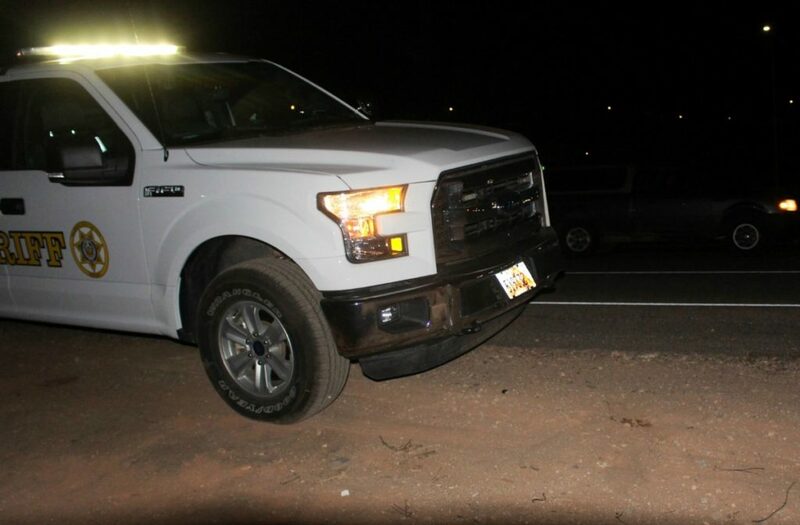 As the man approached Exit 27 a set of spike strips laid minutes before hit the mark and damaged one of the vehicle’s tires, but the driver continued on and exited the interstate. Once off the interstate Thacker turned on Harrisburg Junction, unaware that it was a dead end street. 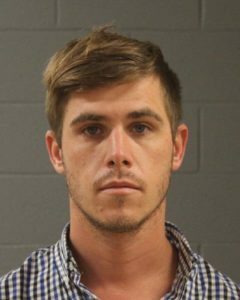 As he turned around to make his way back toward the interstate Thacker hit the pursuing deputy’s vehicle and injured the officer. 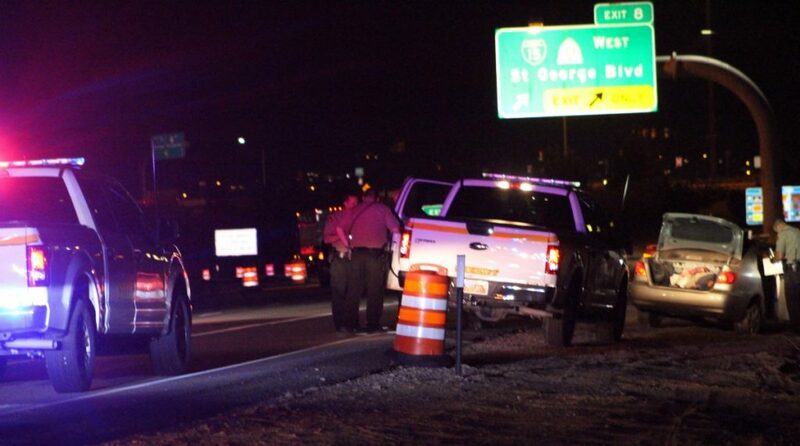 The driver got back on the I-15 at Exit 27 with the injured deputy still in pursuit, Abbot said. 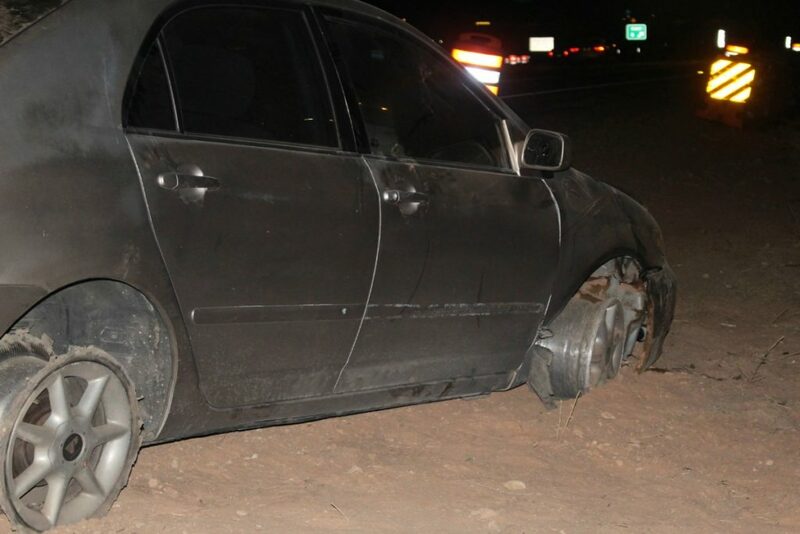 The Toyota’s tire was damaged earlier by the spike strips which slowed the car down, but Thacker was able to keep the car on the roadway as he continued driving, this time south on I-15. Officers were positioned at all exits to prevent Thacker from leaving the interstate again. Once he approached mile marker 17 Thacker’s front tire was blown by a second set of spike strips, further reducing his ability to keep the car on the roadway. Thacker’s vehicle now had two severely damaged wheels, Abbott said, and he finally pulled into the emergency lane a few hundred yards from Exit 8. Thacker surrendered to officers and was quickly handcuffed before being examined by emergency medical personnel at the scene. 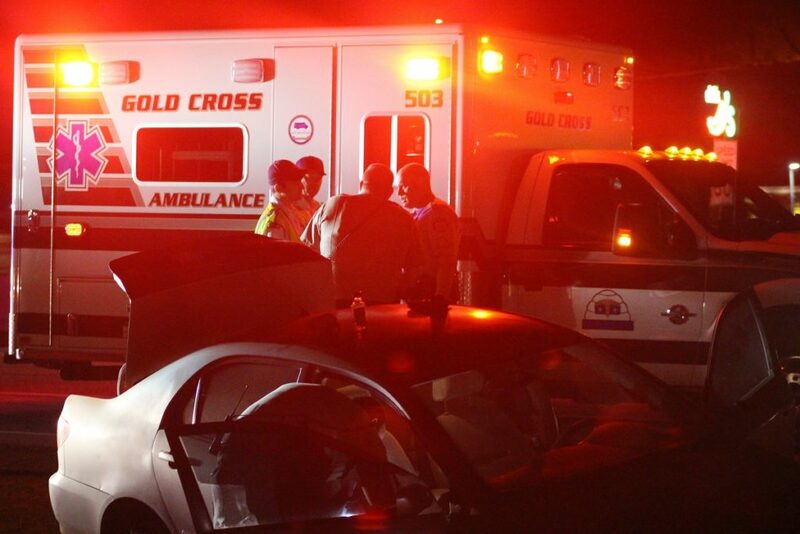 The injured deputy was transported by ambulance to Dixie Regional Medical Center in St. George, where he was treated for his injuries and released the following morning. Thacker was also taken to the hospital for a medical clearance before being transported to Washington County Purgatory Correctional Facility where he was booked on charges of numerous offenses, including evading police, a third-degree felony. 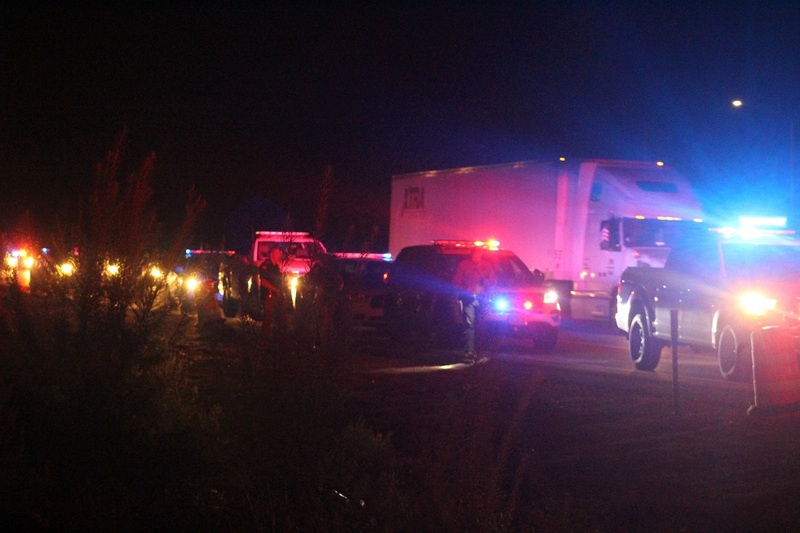 Thirty officers and emergency personnel lined the emergency lane of I-15 by the end of the pursuit, including those officers positioned at the exits, authorities said. Southbound traffic came to a standstill as officers secured the driver and emergency personnel tended to the injured deputy. Thacker made an initial appearance Thursday in 5th District Court on charges of felony evading, along with five misdemeanor charges including driving under the influence, reckless driving, possession or use of a controlled substance, possession of drug paraphernalia, open container, license plate/registration violation, in addition to three infractions. Thacker is being held at Purgatory Correctional Facility on $10,000 bail. This incident remains under investigation. if he had just stopped & been charged for the DUI & substance possession . Old saying tho , ‘ ya can’t fix stupid ‘ . Oh Oh Toto. We’re not not in Kansas anymore !